One of these days I want a house filled with hints of vintage goodness. 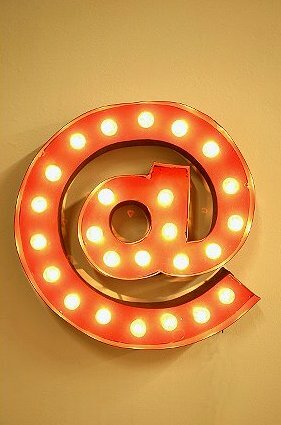 I love, love, love all things vintage and I would love to have original vintage signage. Here’s a few that I found inspiring around the internet! I’ve wanted this ampersand from Urban Outfitters from the first day I laid eyes on it! 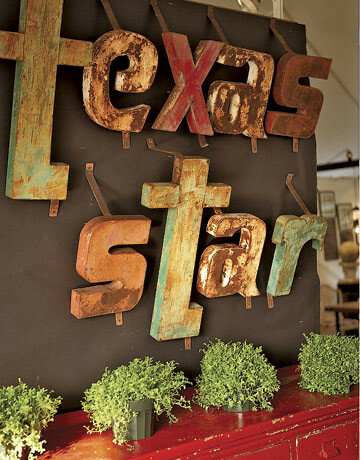 This Texas Star decor (found via Country Living) is amazing. I’m not usually a worn out/rust girl, but for this I could def. make exceptions. And I love huge letters that spell out a phrase like these CUP letters from the Sundance Catalog. So cool. Well, better hop off to bed. I just took a Zicam. I’m crossing my fingers I don’t wake up sick tomorrow. I did everything I could to fight it today (I had a itchy throat when I woke up). Cross your fingers for me! I love letters too. I always am on the lookout. This is so wonderful! Wouldn’t a big long phrase wrapping around your house be so great! OMG! I think I might have to do that. Now what phrase? It could be a poem. I agree – I LOVE THE WRAPPING LETTERS! I might have to do that! My new kitchen/dining area is quite WHITE at the moment. Hmm. I actually bought one for my studio. I just haven’t shared it yet. It’s a metal sign with a 4 on it. 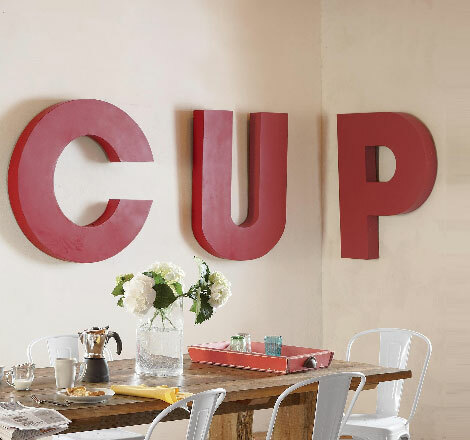 I love the idea of doing a giant vintage saying/font painted on the wall. I’m thinking like the big giant “CAlifornia” you see on vintage postcards. I saw one in country living once…I looked for it for this post, but couldn’t find it. Bummer! Yes, I love the idea of them wrapping too. Soooo cool. I sort of compromised-I decopaged those huge paper mache letters from JoAnn’s (bought with coupon of course). I used pages from a very old, over 100 years, book (set to be discarded). Mine was just part of a wall of different “F”s but I now totally want to do the wrapping idea.